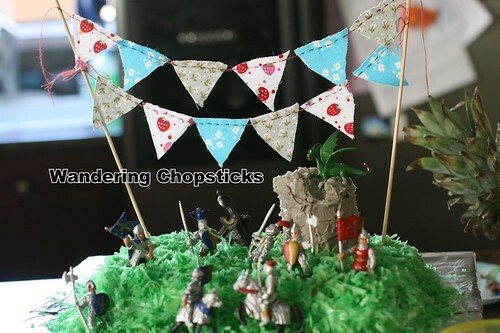 I sewed bunting for my nephew's knight-themed birthday party to give the cake a more tournament-like festive flair. Since the knight figurines were blue and red, those were the two obvious colors. 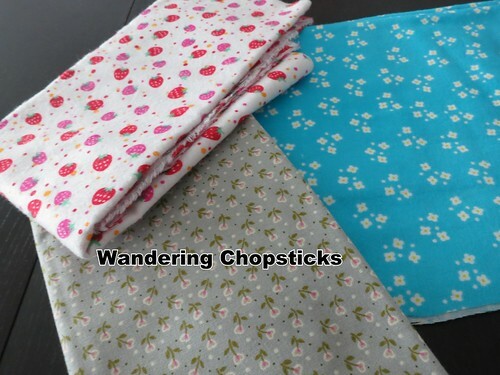 I chose a white fabric with red and pink strawberries and turquoise with white daisies. Then I settled on a gray calico fabric to complement the gray armor. Not much to it. 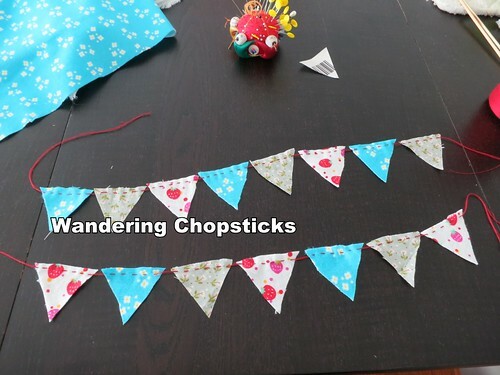 I cut out a test size on a piece of paper, then cut out a dozen flags, sewed them onto cheery red thread, and tied the bunting to skewers. The bunting was a hit! Such a simple thing to add a little special touch. First decide which fabrics you'd like to use. Cut a test flag on a piece of paper. I ended up trimming it down to about 2 inches long and found that a bit large. 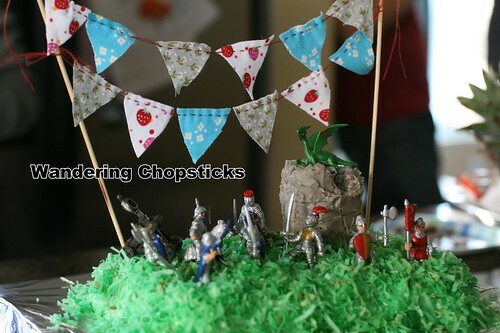 Then cut out however many flags you need. 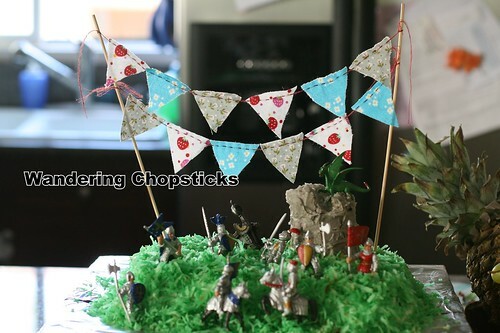 If you lay your paper flag in one direction, and sync it up in the opposite direction, you'll waste less fabric. I ended up cutting too many, just half a dozen flags per row is plenty. If you have baker's twine or cotton string, that'd be perfect. I just ended up doubling up my thread, and then when it folds over again, it's four lengths of thread. 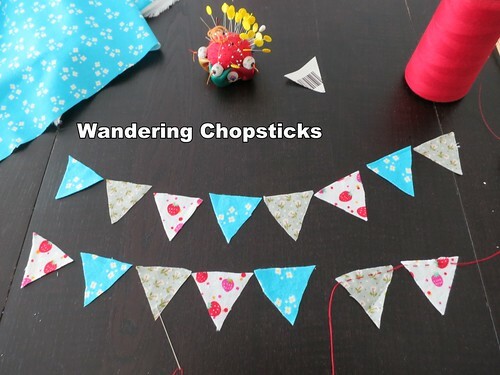 Sew onto the tops of each flag. No need to hem the flags. Be sure to save extra room at the ends to tie them off. Tie onto two skewers and you're done. 4 years ago today, Gyu-Kaku Japanese BBQ Dining - Pasadena (Old Town). 5 years ago today, Chiu Chow Chinese cuisine at Seafood Village - Temple City. 6 years ago today, Rau Muong Xao Toi Voi Chao (Vietnamese Water Spinach Sauteed with Garlic and Fermented Bean Curd). Adorable! What a fun theme. The kids keep me on my toes! I always have to try something creative for them.